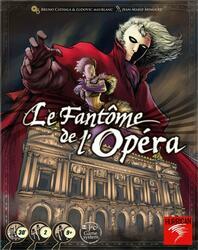 The singer Carlotta is to give a performance at the Opéra Garnier. But a mysterious character doesn't hear him that way. Among eight suspects, find the one posing as the Phantom of the Opera! A player plays the ghost and his opponent the investigator. During a round, each of the eight characters is moved by one of the players. Each suspect has a special power: the janitor locks a door, her daughter uses secret passages... The distribution of characters in the Opera at the end of a round allows or not to clear them. The more suspects left, the more the Carlotta moves towards the "cancelled representation" box. If this square is reached, the ghost wins. If there is only one suspect left in play, the culprit is unmasked and the investigator wins. An original investigation game based on Mr. Jack's mechanisms. A deduction game for 2 players. A deep tactical game, with a very present theme. Contents of the box : 1 board, 8 double-sided character counters, 8 character cards, 3 tokens (La Carlotta /Panne d'électricité /Cadenas), 11 alibis cards, 1 game turn card, the rules.